The costs of bail outs and fiscal stimulus, and the effects of slow economic growth on tax revenues, have sent the ratio of government debt to GDP spiralling. The private sector has at least begun to deleverage. 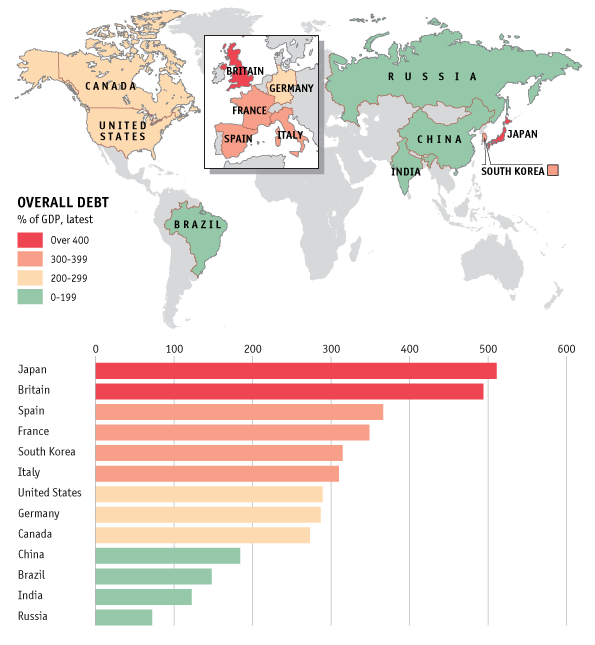 Japan and the United Kingdom have the highest overall debt in the world in percentage of GDP. The United Kingdom together with Canada are the most indebted when measured in household debt as a percentage of GDP. The Economist has made an interactive graph that shows levels of debt as a percentage of GDP for a selection of rich countries and emerging markets as well as the development over the last decades. See the details for each country by clicking here .